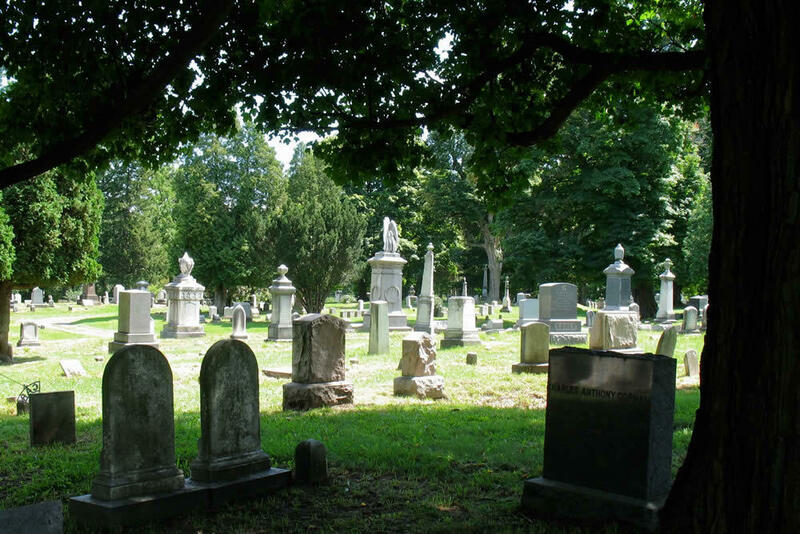 As part of this year's Hudson River Valley Ramble weekend, Albany Rural Cemetery will be holding a walking tour to graves reflecting the area's Dutch heritage, including some of the Cemetery's oldest and most historic points of interests such as the Dutch Reformed lot with headstones dating back to the early 18th century. There will be refreshments and more in the Chapel as well. The tour is at 10 am that day . Tickets are $15. If you're interested, keep an eye on that link for pre-registration details above because other Albany Rural events this year have filled up, some of them quickly. By the way: Tour or no tour, the Albany Rural Cemetery is a beautiful spot for a walk, especially in the fall. The tour will make about a dozen stops featuring abolitionists, poets, Civil War nurses, the first woman admitted to the New York State Bar Association, and more. Because the walk will include hills and unpaved paths, attendees are asked to wear sensible shoes and bring bug spray. The tour is Saturday, June 16 at 10:30 am. Tickets are $15 and space is limited. Call 518-463-7017 to register. The Albany Rural Cemetery is a beautiful place for a walk. 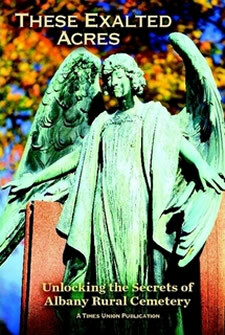 The cemetery has been organizing a handful of these sorts of events lately and they are popular. A historic tour with re-enactors earlier this month filled almost up very quickly, and a Civil War-themed tour in August this summer filled up a few hours after we posted about it last week. So if you'd like to take the tour, it's better to sign up earlier rather than later. Update Thursday morning: The tour is now sold out. Mark Bodnar, known as "The Civil War Guy" at Albany Rural, has documented over one thousand Civil War soldiers and sailors interred in the sacred ground of Albany Rural Cemetery. As your Tour Guide, Mark will lead you on a tour of the graves of several of these Civil War soldiers and sailors, giving you biographical lectures at each stop. The tour will begin at Cypress Pond, where you will be given a brief history of Albany Rural Cemetery, then proceed to numerous grave sites to be introduced to Civil War physicians, Medal of Honor recipients, three brothers that served, politicians, a Confederate soldier, Union men who died in combat, and a soldier that rode in the company of Gen. Ulysses S. Grant AND Gen. Robert E. Lee on the same day during the Civil War! The tour will be off-road on grass and (maybe) mud. Also: "bug spray is a must." It's Saturday, August 4 starting at 9:30 am. Tickets are $15 $25 (see the link above) and space limited. We would not be surprised if this filled. A history tour the cemetery had this past Friday filled up very quickly. 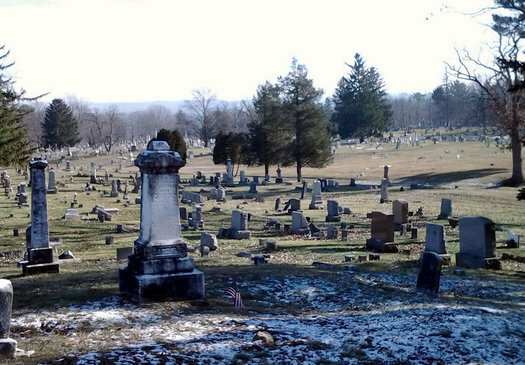 Looking north from section 100 of the Albany Rural -- that part of the cemetery includes the grave of Dr. Thomas Elkins, an inventor and member of the Underground Railroad. Mention the Albany Rural Cemetery and the most common response is, "Oh, that's where President Arthur is buried!" 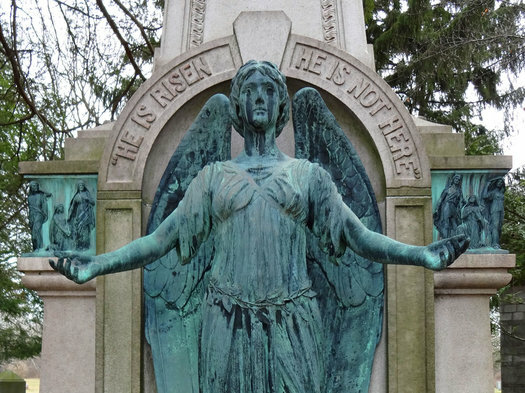 Its 467 acres contain the graves of governors, mayors, soldiers, actors, bankers, and poets, as well as works of monumental art by Erastus Dow Palmer, Robert Launitz, and Charles Calverley. Buried here, too, are dozens of prominent figures in Albany's African-American history -- from slaves to doctors. Visitors to the cemetery can read a backstory in Victorian-era symbolism and carved iconography that is repeated across the sprawling grounds in a kind of cultural shorthand: a torch inverted for a life extinguished; oak leaves and an acorn for a person of old age; ivy for friendship and fidelity; and crossed swords for a life lost in battle. It is a monumental mirror held up to the region's past, and sometimes the heavy weight of history is almost too much to bear. We can trace the ancient heartache of scores of infants and young mothers who died in childbirth in the 1800s. There are vestigial reminders of successive waves of long-conquered diseases such as typhoid, yellow fever, cholera and influenza that killed many Albany citizens. The toll of the nation's wars are commemorated here, too, from the Revolutionary War to 1,030 Civil War soldiers and sailors buried at Albany Rural, as well as casualties of World War I and World War II. Notes of triumph temper the sadness, too, with monuments that celebrate great industrialists, inventors, entrepreneurs, educators and other successful individuals. 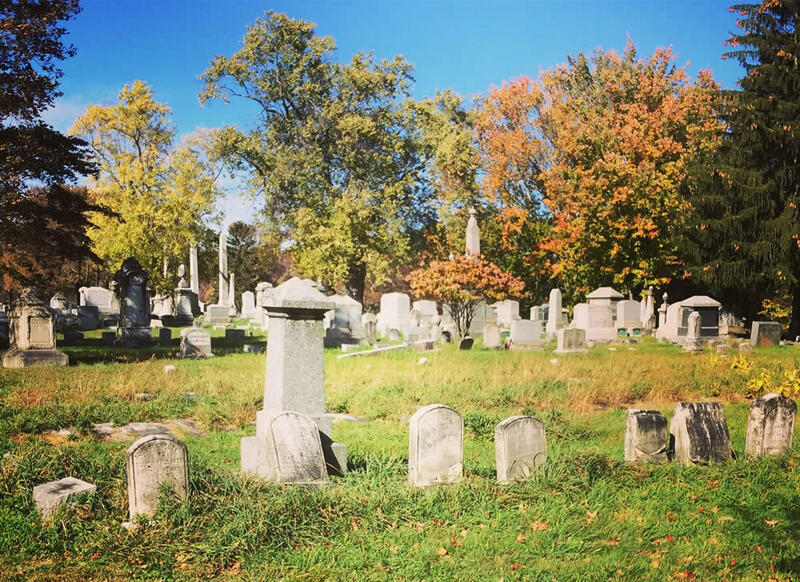 These Exalted Acres: Unlocking the Secrets of Albany Rural Cemetery is being published by the Times Union via Lulu. It's $25 online. Also: Check out the interactive map of the cemetery. Tucked into Albany Rural Cemetery. Let's face it: not all presidents were created equal. Like Hollywood or the NFL, the American executive lineage is a mixed bag of heralded superstars, shunned failures, and neglected bit players. Just look at our currency for proof. Is it fair that Lincoln is on both the penny and the five? Maybe Ulysses S. Grant would like a little more face time outside the fifty. Sorry, Grant, but giving African-Americans protected voting rights via the Fifteenth Amendment isn't as epic as ending slavery, so it's just the one bill for you. And don't get me started on all the stuff named after Washington in this country. The first guy to do anything always gets the lion's share of love. Meanwhile, Rutherford B. Hayes gets jack. The argument that Hayes did not have the same panache as Washington is almost acceptable until you gaze upon the absolutely scrumptious beard the former kept during his reign as president. 'Twas a follicle forest that continues to shame any growth spotted in today's hipster enclaves. Disparity of popularity between the presidents is also evident in their respective grave sites. 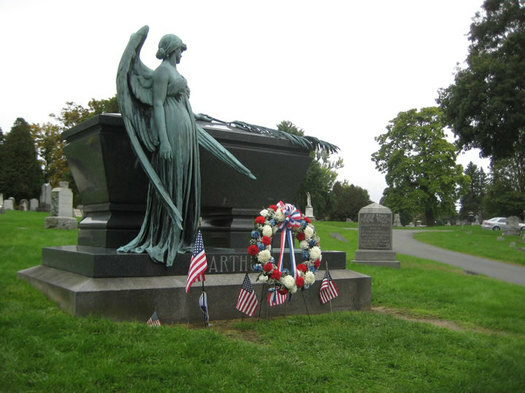 The Capital Region boasts a shining example in the grave of Chester A. Arthur, which is tucked deep into the Albany Rural Cemetery in Menands.